Made especially for the man who keeps track not only of his time, but others’ time, on the track, in the pool, or at the speedway, the TAG Heuer Carrera Black Dial Tachymeter Men’s Watch CV2010.BA0794 is unmatched in functionality and elegance. The stainless steel case features a tachymeter fixed-bezel that is plated black. For the sporting gentleman, a tachymeter is essential for measuring average speed. The link steel band adds elegance to the watch that a leather band could not. The band also features both polished steel and fine brushed steel, which provides a slight contrast. 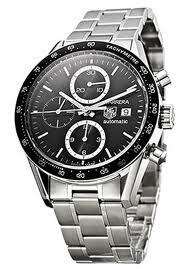 This added detail reflects the quality synonymous with the TAG Heuer brand. The dial features a chronograph that allows for both time-keeping and stopwatch functions, which are necessary for professional men with an active lifestyle. The black color of the dial contrasts nicely with the silver function details: silver hands, silver baton hour markers, and silver sub-dials. The hands and hour markers are also luminescent, providing easy reading in the evenings or in the dark. Because of the open flange design, reading minutes and seconds is effortless. The only drawback to this watch might be that you find yourself with more functions than you need. It is somewhat difficult to read the face with so many dials and numbers, but those dials and numbers are indispensable if you need to do serious time-keeping. The Carrera retails at $3,600 but can be found for less online. TheWatchLocker.com has the lowest price at $2,405. However, there are a variety of more reputable retailers that can beat the retail price as well. These versions range in retail price from $3,500 to $5,200. An online search of the model number will provide a list of online retailers that will most likely sell for less than the manufacturer suggests. 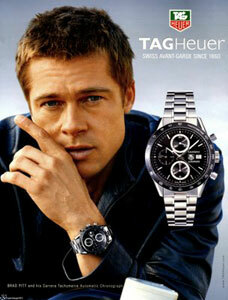 If you prefer to shop at an authorized TAG Heuer retailer, you can find the store nearest you at tagheuer.com. All of the Carrera watches are handsome, but none is quite as striking as the Carrera with the black dial and the polished steel band CV2010.BA0794. It is a watch that will provide elegance in the boardroom and function for recreation, a must-have for the active gentleman.